I remember the first time I wished I had a .44 Magnum revolver. I was pig hunting and the cover was so thick I needed one hand to push the bush out of my way and the 20″ barreled Remington 870 pump action 12 gauge was just too big and awkward. It was one of those close encounter hunts where you could hear pig, and you could smell pig, they were so close that any shot you got was going to have to be quick. I’d like to say that the happy ending to the story was my going to the gun shop and coming home with a nice new Smith & Wesson Model 29 but alas my story does not have such a happy ending. I was living down in Australia back then and were I to wander into my local police station and ask to license a .44 Magnum revolver for pig hunting the sergeant would have likely had an apoplexy as he berated me for wanting such a ridiculous thing when there was “no animal in Australia that you couldn’t shoot with a .22 rimfire”. A handgun? For hunting? Oh no – that would be exceedingly illegal. So the sad ending to my story is that I kept on using the 20″ barreled Remington 870 for pig shoots and it worked well enough. But a .44 Magnum revolver would have worked a whole lot better. So if you are living in the States be very grateful that you can buy a .44 Magnum revolver and go hunting with it. Elmer Keith’s pre-Model 29 Smith & Wesson which was presented to him by Carl R. Helstrom. (Picture courtesy gunsandammo.com). Back before the advent of the .44 Remington Magnum there wasn’t much available that one could use as a revolver hunting cartridge. The idea seems to have gotten going with the creation of the Smith & Wesson N Frame 38/44 Heavy Duty, which led to the invention of the .357 Magnum in the Smith & Wesson Model 27. The whole idea of a more powerful handgun cartridge having come about as outlaws started using automobiles and the police wanted revolvers that would penetrate an automobile body so they could stop the bad guys. Having created the 38/44 Heavy Duty the folks at Smith & Wesson wondered if there might be a market for a hunting revolver so they introduced a new model called the Outdoorsman with a 6½” barrel chambered for the 38/44. It didn’t take long for a gunwriter named Phil Sharpe to get into experimenting with higher pressure loadings in the 38/44 Outdoorsman and to discover that it really needed proper target sights to be a viable hunting handgun. Smith & Wesson’s Vice President Colonel Douglas B. Wesson was soon enthusiastic about the idea and by 1935 both the Model 27 and the .357 Magnum had been born. You’ll find our Revivaler post on the Model 27 and the .357 Magnum if you click here. But if you are in thick cover hunting wild pigs then a .357 Magnum is still not enough gun. Elmer Keith’s personal carry Smith & Wesson Model 29 .44 Magnum with Sparks holster. (Picture courtesy gunsandammo.com). Elmer Keith was born in 1899 in Missouri and thus amongst his family there were those who were veterans of the American Civil War who had fought on the Confederate side as well as those who had lived through the Wild West era of the 1870’s and 1880’s. Elmer Keith’s grandfather had been town marshal of Hardin, Missouri for example, and his uncle had been foreman for Theodore Rooseveldt’s North Dakota ranch. So the young Elmer grew up in an environment that had a rich old west gun heritage. Elmer Keith’s first gun was a .36 caliber Colt Old Navy cap and ball revolver which he traded for a Colt Single Action Army in 32/20. Discovering that was not enough gun he moved up to the Colt Single Action in .45 Colt and it was with one of those that he first made a name for himself when he blew the gun up taking half the cylinder and the top strap off whilst firing the 4th July salute. He published that article in the 15th August 1925 issue of the American Rifleman and it started his career as a gun writer. Having blown up one Colt SAA Elmer Keith moved into modified Colts this one being a .44 Special with Smith & Wesson rear sight and front sight attached by a barrel band. (Picture courtesy gunsandammo.com). Elmer Keith moved from the .45 Colt to the .44 Special mainly because he wanted the extra cylinder wall thickness that the .44 Special had because of its smaller diameter. Keith’s custom revolvers had welded top straps, a Bisley hammer, and the front sight mounted on a barrel band. We suspect he may have had a soldered front sight come off during firing and so the barrel band ensured that the front sight stayed on the barrel where it belonged. During this time Elmer Keith did not work alone but collaborated with a number of others including Howard Croft, who was working on lightweight revolver designs, and gunsmiths Neal Houchins, R.F. Sedgley, and J.D. O’Meara. This was during the late 1920’s. Left side view of the rig shown above. (Picture courtesy gunsandammo.com). Keith eventually moved onto the Smith & Wesson N Frame Triple Lock .44 Special in the 1950’s, which were to become his favored revolver. And Elmer Keith was by no means alone in his experimentation to get more performance out of the .44 Special. Phil Sharpe – the father of the .357 Magnum did not stop with it but got to work on doing the same sort of thing with the .44 Special, as did John LaChuk who reasoned that the balloon headed .44 Special cases were a limit to achieving the needed pressures to achieve the full potential of the .44 Special so he modified 30-40 Krag solid head rifle cases to .44 Special dimensions and worked up loads with those. John LaChuk eventually created his .44 Lancer using the modified 30-40 Krag brass with a case length of 1.280” and a loading of 22.5 grains of 2400 powder to get a muzzle velocity up around the 1500fps mark. 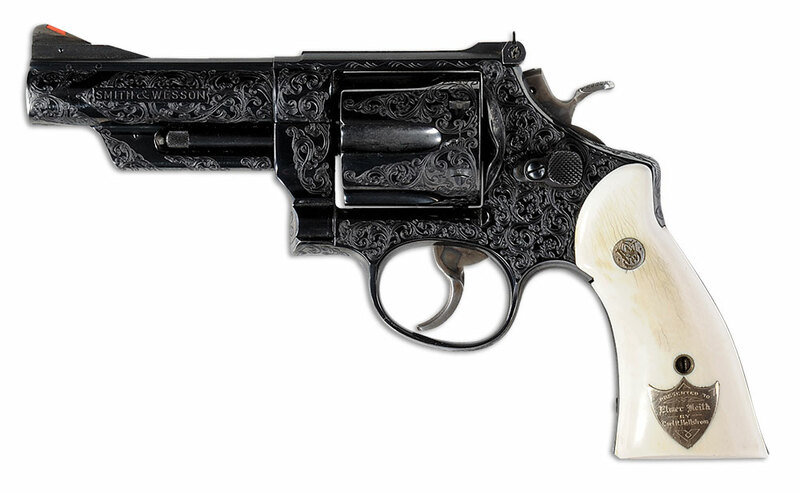 Smith & Wesson Model 29 with 6½” barrel. The classic “Dirty Harry” revolver. (Picture courtesy Smith & Wesson). In the early to mid fifties Smith & Wesson were hearing that there was a demand for a production revolver and cartridge of the “souped up” .44 Special variety. Given that the concussion of the muzzle blast of one of these revolvers has to be experienced to be believed it may have been difficult to believe that such a market might exist. Nonetheless the .44 Magnum was created with a case length of 1.285″, just 0.005″ more than John LaChuk’s .44 Lancer. The first revolver was made in December 1955 and made its public debut in January 1956. Ruger managed to introduce their Blackhawk revolver for the .44 Magnum cartridge at almost the same time as Smith & Wesson and there has been some conjecture as to how they managed to do that. Some say that a Ruger employee accidentally came across a .44 Magnum case, others have suggested other things, no-one knows for sure except those at Ruger. It was a great blessing that Ruger did have their Blackhawk available so early as it was a tad less expensive than the Smith & Wesson and it helped supply the demand. Early model “3 screw” Ruger Blackhawk in .44 Remington Magnum. (Picture courtesy gunauction.com). These early Ruger Blackhawks were built on the Ruger Blackhawk frame that had been designed for the .357 Magnum. This is a smaller frame than the later Super Blackhawk and these three screw revolvers did not have the later transfer bar trigger system. They are now collectors items. If you have one it needs to be carried in the same way as a Colt Single Action with an empty chamber under the hammer. The .44 Remington Magnum was and is a lot of cartridge to fire in a revolver, but not a lot of cartridge in a rifle. The .44 Magnum in a lever action carbine or the old Ruger Model 44 semi-automatic is quite mild mannered. But in a revolver it has both bark and bite. I think the bark is worse than the bite but this is still not a comfortable handgun for most people to shoot. Using earmuffs graded for pneumatic drilling is recommended (that’s what I use). The cartridge and the revolvers chambered for it sold reasonably well and even appeared across the Atlantic in catalogs published by London gunmakers Thomas Bland and Sons especially for people in places like Africa where having some anti lion or leopard medicine on your belt could make the difference between getting home for dinner or becoming dinner. However, it wasn’t until the cartridge and the Smith & Wesson Model 29 became movie stars that the popularity of the .44 Magnum went through the roof. Clint Eastwood, the Smith & Wesson Model 29 .44 Remington Magnum, and “do you feel lucky punk?”. (Picture courtesy imdb.com). 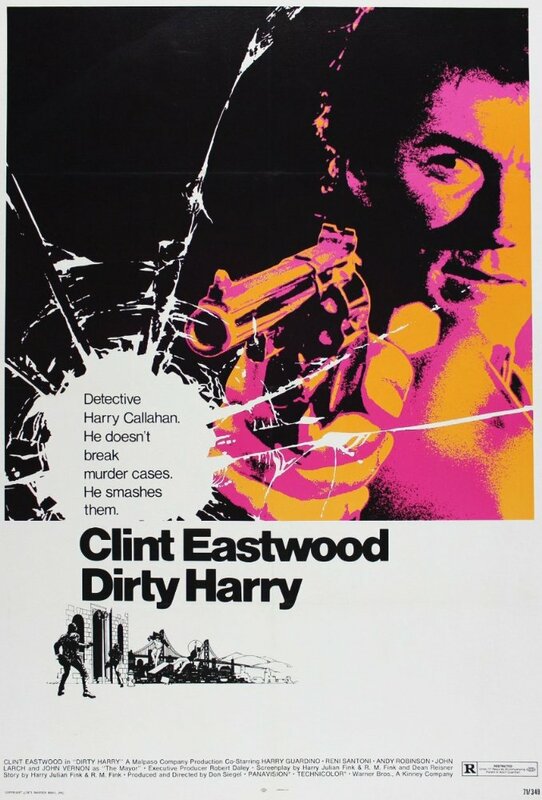 The 1971 Movie “Dirty Harry” in which San Francisco police inspector Harry Callahan makes his famous statement “This is a .44 Magnum, the most powerful handgun in the world … do you feel lucky punk?” was a turning point for sales of Smith & Wesson Model 29 revolvers with 6½” barrels. There are likely a lot of people who have one of these in their gun cabinet not because they intend to go deer or wild pig shooting with them but simply because of the movie. Interestingly in the movie Harry Callahan also uses a Winchester Model 70 in .458 Winchester Magnum as his counter sniper rifle but sales of .458 Winchester Magnum rifles did not shoot upwards. The rifle does not get the same script attention as the revolver – the “… do you feel lucky punk?” line was a perfect sales pitch for the Smith & Wesson Model 29. As an aside some have suggested that the Winchester Model 70 in .458 Winchester Magnum was a spurious choice as a counter sniper rifle. Was it? A .458 Winchester Magnum can be made to shoot sub-MOA groups so they are capable of the accuracy and have plenty of power for punching through car bodies, doors, glass windows etc. And for use in an urban setting the .458 Winchester Magnum requires a smaller danger area template “drop zone” than say a 7.62 NATO. Just a thought – it was after all just a movie. 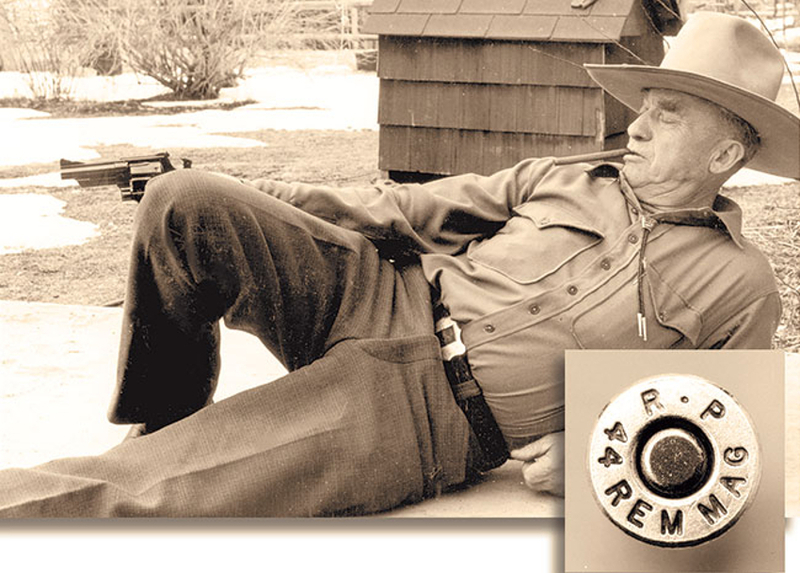 Elmer Keith preferred the 4″ barreled Model 29. (Picture courtesy Smith & Wesson). The .44 Remington Magnum remains to this day all the handgun most of us can shoot competently but it is the basic caliber for most hunting in the deer on up class. It is enough gun for wild pigs and the double action revolver remains the single best firearm if you have to go into thick cover after something like a wild pig. 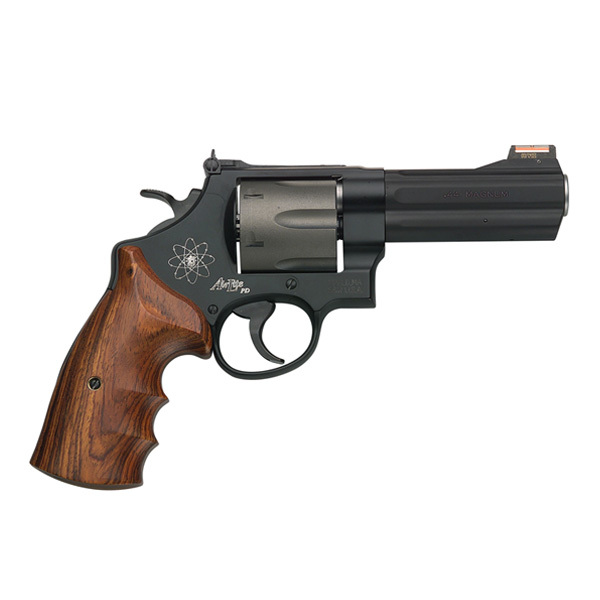 Similarly if you need a handgun for protection against bears, crocodiles, leopards or anything similar then a double action revolver such as the Smith & Wesson Model 29 in .44 Magnum remains the preferred balance between power and controllability. 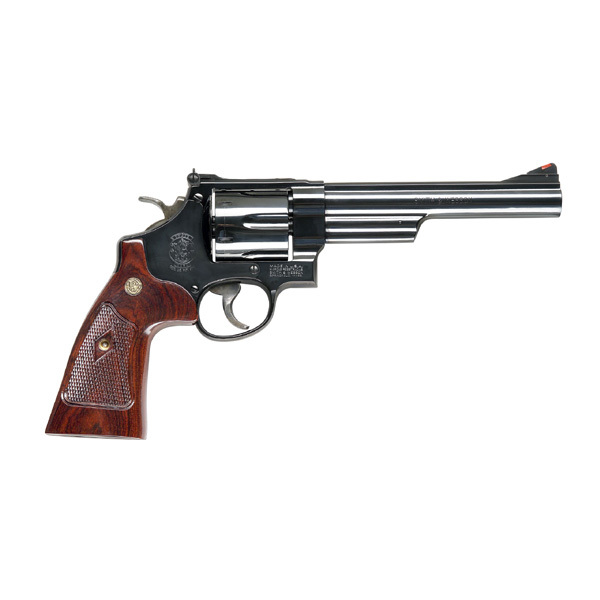 The Smith & Wesson Model 29 is still in current manufacture and you will find them listed in Smith & Wesson’s Classic series. 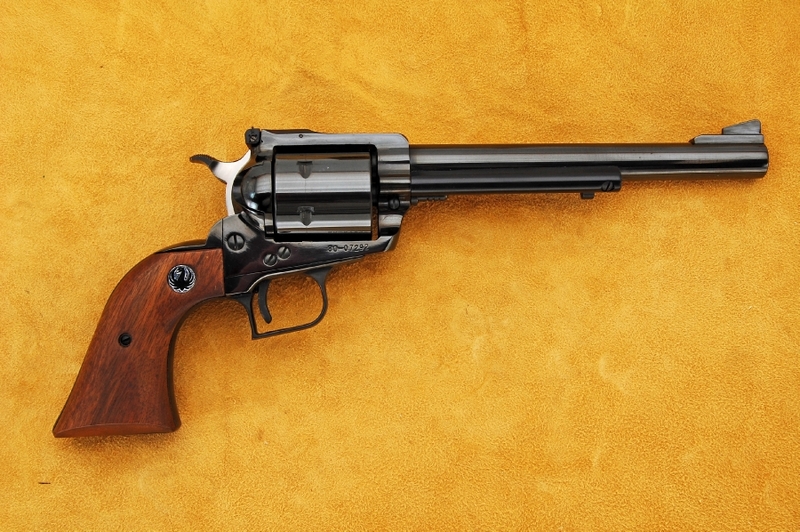 The 6½” barrel Classic Smith & Wesson Model 29 similar to the one used by “Dirty Harry” is found on Smith & Wesson’s web site if you click here. 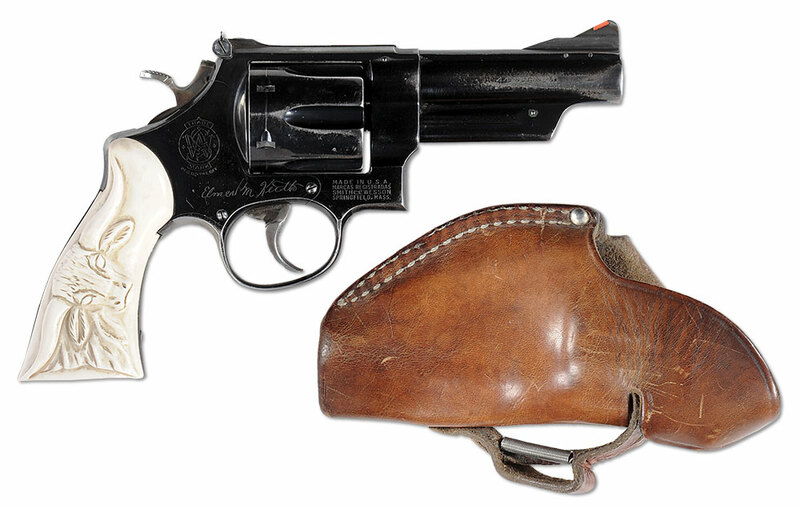 The 4″ barrel Classic Smith & Wesson Model 29 that was the preferred style for Elmer Keith is found on Smith & Wesson’s web site if you click here. 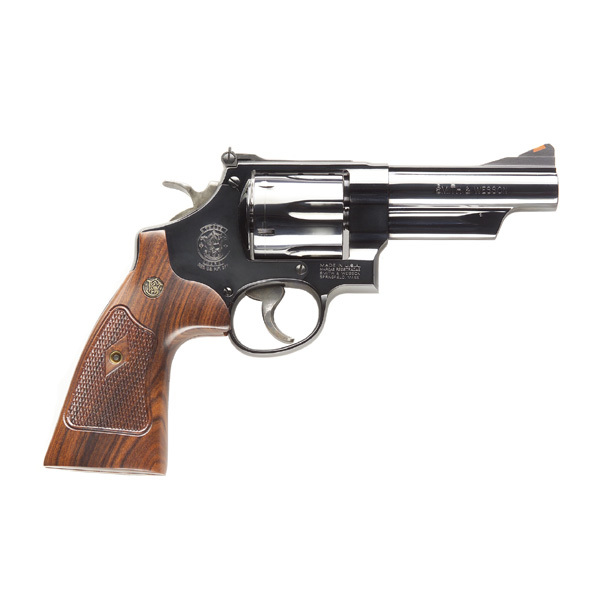 The new Model 329PD Smith & Wesson is found on Smith & Wesson’s web site if you click here. The new model .44 Magnum from Smith & Wesson is the Model 329PD. (Picture courtesy Smith & Wesson). Elmer Keith was not the father of the .44 Remington Magnum but he was certainly a highly influential member of the group of experimenters and advocates for its creation. He created the Keith semi-wadcutter bullet that you will find in Lyman’s catalog as cast bullet #429421. He was a strong advocate of the “use enough gun” school and favored rifles of .338″ or more for most hunting, and the .44 Remington Magnum as the best choice as a hunting handgun. We are grateful for his legacy and for the contributions of all those others who worked together to give us this wonderful cartridge. You will find the detailed history of the development of the .44 Remington Magnum in John Taffin’s on-line book “The Book of the .44” especially Chapter 9 “The Road to the .44 Magnum – Improving the .44 Special” if you click here. You will find a range of John Taffin’s books on Amazon if you click here. Elmer Keith was a quite prolific writer and you will find a selection of his books on Amazon if you click here. Elmer Keith enjoyed big bore handguns and large cigars. They’re two things that “make my day”. How about you? (Picture courtesy gunsandammo.com). 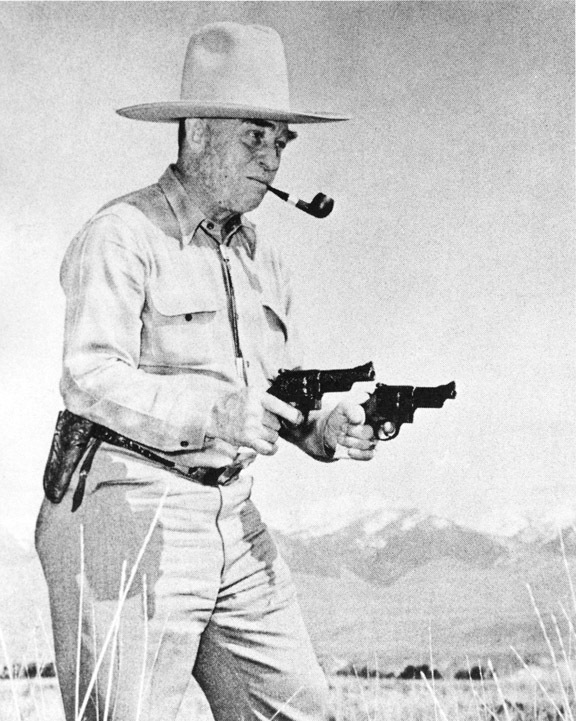 (Feature image at the head of this post is of Elmer Keith with two of his favorite Smith & Wesson revolvers, a 4″ .44 Special and a 4½” .44 Magnum. Picture courtesy sixguns.com).